Today, when you order "The Le Paul Wallet by Heinz Mentin", you'll instantly be emailed a Penguin Magic gift certificate. You can spend it on anything you like at Penguin, just like cash. Just complete your order as normal, and within seconds you'll get an email with your gift certificate. A Borrowed And Signed Banknote Is Found Inside A Sealed Envelope Taken from A Zippered Wallet. The performer asks for a loan of a banknote. The spectator signs their name on it before it is then vanished and later found inside a sealed envelope that is taken from a zippered wallet. In the instructions you also find how to vanish the banknote. 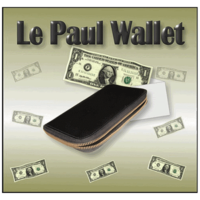 This wallet is used by famous magicians such as Terry Seabrooke and Wayne Dobson. The wallet received is nothing like the picture. The classic version is a simple fully zipped leather pouch as pictured. The one received is a simple fold wallet with zipper pouch inside.